1. Rinse the mussels in cold water and remove any beards. 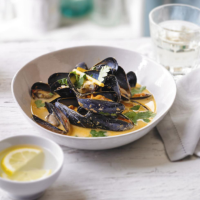 Remove any mussels that don’t close when tapped on a hard surface. Heat the oil in a large heavy-based pan and add the onion. Cook over a gentle heat for 3 minutes until softened. 2. Add the curry paste and lemongrass and stir for a minute then add the mussels and cover the pan. Simmer gently for 3-4 minutes, shaking the pan, until the mussels open. Remove and discard any that don’t open. 3. Add the coconut milk and heat through without boiling. Stir in the fish sauce and scatter over the chopped coriander. Serve with steamed Thai jasmine rice to soak up the sauce.